Height adjustable tables offer a solution that is flexible and erognomic for your conference or training room. These promote ergonomic health by being quickly and easily adjustable, providing your ideal work service from a seated position to your standing height. A great addition to any office as a stand alone table desk or as a replacement return or bridge for an existing L-Shaped or U-Shaped desk. 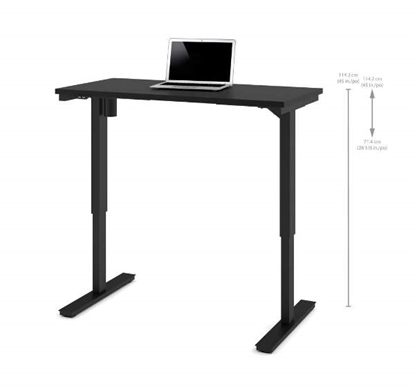 This height adjustable table desk features a 220lbs. lifting capacity, a digital programmable control unit, and adjusts from 27.5"-45.25" Height. A versatile height adjustable table that can be used in almost any home or commercial office setting. This height adjustable table includes an digital controller with 4 programmable positions and can lift 220lbs. A great addition to any home office, private office, or multipurpose training room. 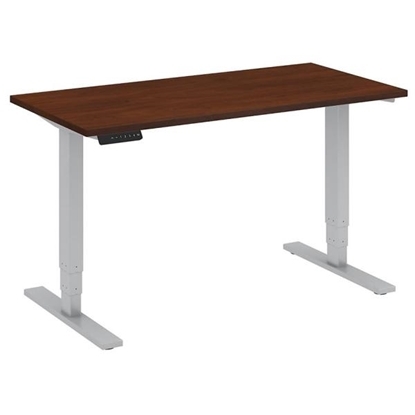 This table is available in 4 different top colors and can adjust from 27.5"-45.25"H and features a digital controller with 4 programmable positions. Great for use as a table desk or a multipurpose table in a training or meeting room. 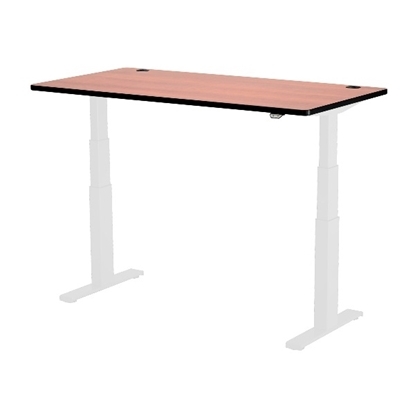 This height adjustable table can range from 27.5"-45.25"H and includes a digital controller that can be programmed with 4 preset height positions. A great addition to any home office or commercial office. 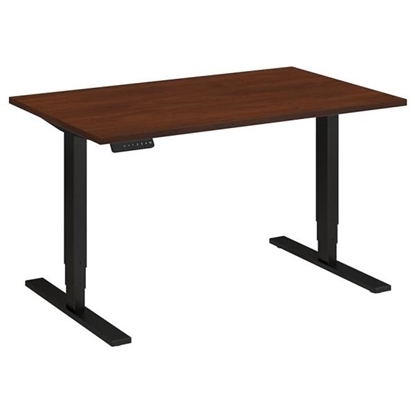 This height adjustable table can be used as a stand alone desk, a multipurpose table, or as a piece of an entire office. This unit features an electric motor and digital control unit to make working sitting or standing easy. 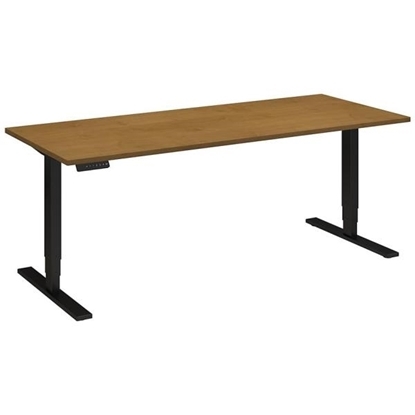 Great for use as a table desk, training room table, or multipurpose work surface. This height adjustable table can lift 220lbs. using an electric motor with a digital control unit that can be programmed with 4 preset heights. This Bestar sit stand desk a great addition to any existing office, training room, or multipurpose work room. The height adjustable table desk operates using an electric mechanism and is available in a wide variety of colors. Perfect for a laptop or tablet PC. By adding the Bestar electric height adjustable table to your work environment, you ensure the best sitting position according to your size while benefiting of all the advantages to work in a standing position.Order today and get free shipping! 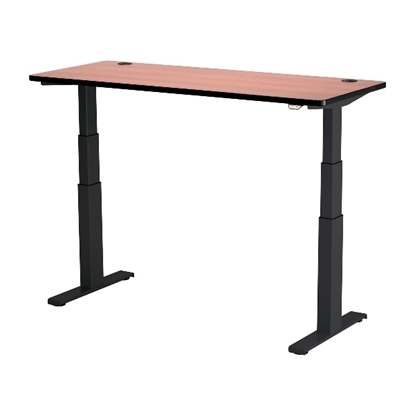 This sit stand desk from Bestar is a great choice for a training room or multipurpose room. 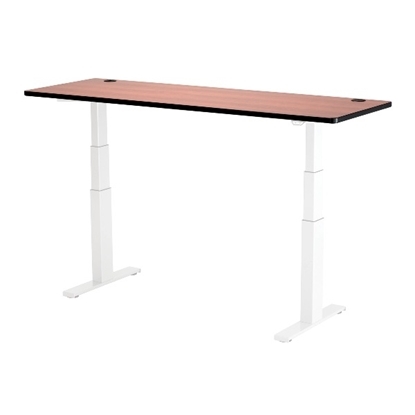 Add this height adjustable work surface to a private office. This table desk features a durable commercial grade work surface with melamine finish that resists scratches, stains and burns and is available in a wide assortment of colors. Perfect for a laptop or tablet PC.By adding the Bestar electric height adjustable table to your work environment, you ensure the best sitting position according to your size while benefiting of all the advantages to work in a standing position. Order yours today and get free shipping! 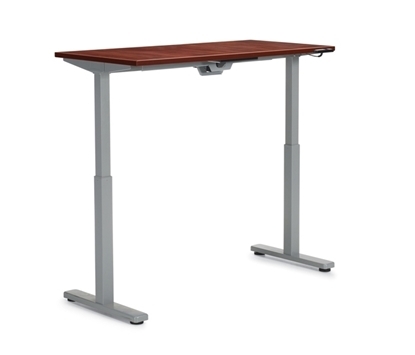 Change the way you work at anytime with this height adjustable training table. This table allows you to work while sitting or standing and can be changed electronically between the two at any time to accommodate a change in activity. A great choice for any work area that needs some versatility. 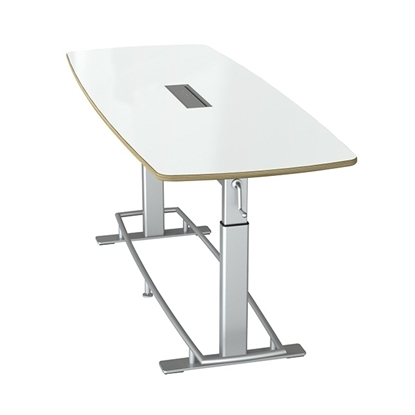 This height adjustable table adjusts with the push of a button to accommodate any activity. It can seat two in a training room setting or be used as a work space for an individual who wishes to spread their work out. 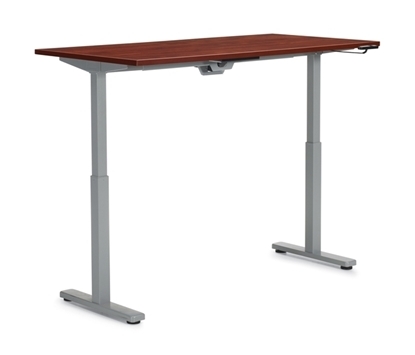 Work on your feet and sitting down at the same space with this height adjustable table. This table adjusts between 24-50"H electronically and can be changed easily to fit the needs of your mood or tasks. 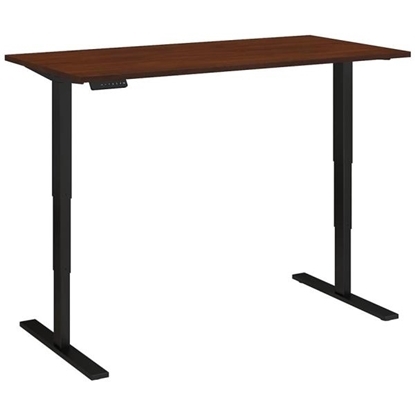 This Bush sit stand desk can be used in training rooms, multipurpose rooms, or as a replacement for a large office desk. This height adjustable unit is electronically operated and moves from 23" to 49" high. With a durable laminate work surface, this desk is easy to clean and stays beautiful. Order today and get free shipping! 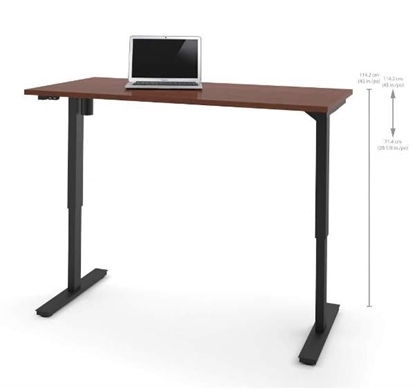 A sit stand desk that can be used almost anywhere with an electric height adjustable mechanism. This model from Bush adjusts between a height of 23" low to 49" high and is available in a number of color combinations. The durable laminate finish will both impress and stand the test of time. Order now and get free shipping! An electronically controlled sit stand table desk that can be used as an office desk, training table, or as a multi purpose room piece. This unit can be adjusted from 23" low to 49" high at a speed of 1.5" per second. A sit stand table desk with an ample amount of works pace, this unit can be used in a private or public office or as a training table for two users to share in a group setting. This desk can adjust between 23" to 49" in height to accommodate both sitting and standing. Improve your health today! A great addition to any meeting or conference room. This table is height adjustable allowing you to set up your room in a number of ways to allow for a number of different activities. This table also is available in 5 difference top finishes including a dry erase finish. A great addition to any conference room or meeting area. This table is available in 5 top finishes including a unique dry erase top. This table also features height adjustability allowing you to set it to a variety of heights to accommodate any need.